Thinking Horse is about understanding how the horse’s mind works, and using that as a model when we’re handling and riding them: recognising that a horse’s mind is not just a load of reactions (push button A, and B happens) but somewhere where a complex range of thought processes and decisions take place. Many people claim they can teach us to “speak horse”, using many different methods and approaches. When you compare these, there are generally several common elements, some aspects that differ, and while almost all offer a substantial amount of “how to…” most are rather light on the “why it works…” side, so it’s hard to see it from the horse’s point of view. When you look at the roots of classical horsemanship, the old masters themselves didn’t necessarily know WHY a particular approach worked, they just knew it DID work, and so that was what they used. Modern research is starting to discover why, and this information can help us understand what is going on from the horse’s point of view. Thinking Horse aims to help you understand the principles of equine thinking and behaviour, and how these can influence the way the horse sees the world and the people around it. 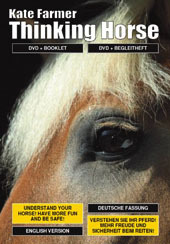 The exercises offered on this website, on the Thinking Horse DVD, and in my books and articles are by no means exclusive or exhaustive and are simply a starting point to reaching a better understanding of the horse’s mind. As more and more is discovered about how the horse’s mind works, the exercises recommended and the explanations behind them are constantly reviewed and updated. Armed with an insight into WHY these exercises are important, I hope you will be able to work more effectively and harmoniously with your horses in your chosen discipline.